for behold—all acts of Love and Pleasure are my rituals. All acts of love and pleasure are my rituals—Taurus (Fixed Earth) invites full embodiment. In this season, our senses expand and we learn to trust our desires. From this place we join the flow of life expanding into the growing season. The Fixed signs (Taurus, Leo, Scorpio and Aquarius) are special. Just ask anyone who has a Fixed Sun. They’re special because they have a big role to play in the wheel of life we call the zodiac. The Fixed signs are the anchors of the wheel, each representing an element—Taurus for earth, Leo for fire, Scorpio for water, and Aquarius for air. Fixed signs feel primal. The very word, “fixed,” implies that change does not come easily to these signs. As resource managers of their element, Fixed signs have to account for sustainability and values before opening to change. But this does not mean Fixed signs are unchanging. When they change, the reverberations are felt deeply. It is as if a new anchor has been set in place. Evolution relies on the pattern described by the modalities of astrology: Initiating (Cardinal), Anchoring (Fixed), and Realigning (Mutable). The current lunar cycle is about the role that earth plays in our evolutionary processes. Another Fixed sign mystery is that each Fixed sign needs the challenge posed by the other Fixed signs to elevate its expression. In astrological theory, the relationship between signs of the same modality creates stress that also creates gifts. Fixed signs run the risk of getting stuck in possessiveness, defensiveness, and obstinacy. As strong guardians of their elemental truths, Fixed signs don’t easily merge with others. But just like they resist change but can, when Fixed signs merge, the reverberations are felt far and wide. Notice these essential qualities this week as the Sun in Taurus is opposed by the Moon in Scorpio, with both square to Jupiter in Leo on the Full Moon of May 3. The missing Fixed sign, Aquarius, still makes itself known by its absence in the chart for the Full Moon. The missing sign is an important key for integration. The Aquarian anchor of air—collective vision, holistic systems, radical change—helps us get perspective on Leo’s fire—self-expression, personal impact, and life force. The Scorpio anchor of water—flooding, flowing, feeling—helps us get perspective on Taurus’ earth—values, resources, and desire. The Goddess of the poem let’s us know that She is the attainment of our desires. May this season of beauty lead you to Her elemental blessings. Monday, April 27. Before the Moon slips into Virgo this evening, we get one more day of Leo learning. The lesson today is inspired by the Moon in Leo (Fixed Fire) square Mercury in Taurus (Fixed Earth). Most people have a preference between extroversion and introversion although each of us can shift along the continuum. That continuum may be quite noticeable today. Mercury—ally of thought, wit, and communication—is solidly attached to concrete concepts, slow processes, and firm facts. Nothing flashy about this energy. The Moon has been in Leo for a couple of days now and we might be feeling a little bit wistful about leaving behind the great, sparkly glow this sign places on life. But everything changes. This is one of the lasting lessons that the Moon teaches. If you lean to the introverted side of things, you might welcome the shift into pragmatic Virgo tonight. If not, know that Leo will come around again. Tuesday, April 28. Some astrologers think Virgo is ruled by Chiron, the shamanic healer/warrior centaur god. With today’s Moon in Virgo and two planets aspecting Chiron (Mars sextile and Venus square), we have a chance to get to know this complex archetype a little bit better. The link between Virgo and Chiron is about healing. Chiron uses his own wounds to access healing wisdom. Virgo’s healing modalities include the talent of synthesizing systems. Virgo comprehends the distinctions between different parts and looks for a way to make them whole. Mars in Taurus (Fixed Earth) anchors pragmatic energy for finding healing. Venus in Gemini (Mutable Air) presents a challenge to finding healing: too many choices, too many distractions. Take a light-hearted approach. This health-minded Moon opposes Neptune today, too. We may be frustrated by a lack of clear diagnosis or feelings of vulnerability that ailments bring up. Practice self-compassion. April 29—Gibbous Moon: Perfecting. Earth energy abounds today helping us to really understand the value of this lunar cycle. We began this cycle at the very end of Aries (Cardinal Fire) on April 18 and immediately moved into Taurus. The cusp between Aries and Taurus is about grounding our beginnings into solid manifestations. Earth provides a good counterbalance to fire’s expansiveness. As we perfect the relationship between fire and earth in this phase of the Moon, we get a good dose of earth’s gifts and challenges. The Moon in Virgo (Mutable Earth) is all about making things better. Putting our lives in order can help harness the power of earth. Pluto in Capricorn (Cardinal Earth) encourages the Virgo Moon to transform our foundations. Fears may be keeping us stuck. It may be time to let go of that and leap across the chasm to new ground. Mars in Taurus (Fixed Earth) reminds us that this process of betterment and transformation will happen slowly and in its own time—we also learn to trust. Remember these allies as we also notice that anxiety or lack of focus is a challenge today. The inspiration comes from a sextile between the Sun in Taurus and Neptune in Pisces (Mutable Water). This aspect encourages a broader view and a compassionate desire to connect with others. The Earth feels alive and sacred. Thursday, April 30. Let’s celebrate the element of air today. The Moon enters Libra (Cardinal Air) this morning (CDT) and Mercury leaves Taurus behind to enter Gemini (Mutable Air). Since Mercury rules Gemini, we will notice life speeding up because thoughts are speeding up. However, we are still in the waxing phase of this Taurus-inspired lunar cycle, so there is also strong desire to remain slow and steady. The friction between earth and air creates wisdom. Notice a greater desire to socialize and share your wisdom. Friday, May 1. Beltane. This Pagan holy day is inspired by the Earth’s fecundity. Dancing around the Maypole connects us to this sensual, fertile energy. The Moon in Libra adds interest in partnering. The Moon’s contribution to this desire is fleeting, but influences the mystery and allure of the other on this day. Be aware, you might fall farther into infatuation than you expected. The encouraging aspect between the Moon and Jupiter in Leo (Fixed Fire) does nothing to squelch this possibility. In fact, romance is indicated. Let yourself feel the rising life force of the Earth. Desire and joy feed the renewal promised by this season. The Moon also contacts Pluto and Uranus to connect festivities to the transformation and change we long to bring to the whole world. Saturday, May 2. The Moon in Libra (Cardinal Air) is kissed by Venus in Gemini (Mutable Air) this morning (CDT) and then settles into producing a potentially very calm and enjoyable day, especially if you aren’t too ambitious. Enjoy the Spring day, making lighthearted connections with others or spend your time engrossed in a book or making your environment beautiful. Tonight the Moon enters Scorpio and the mood deepens opening the door to Full Moon illumination tomorrow. 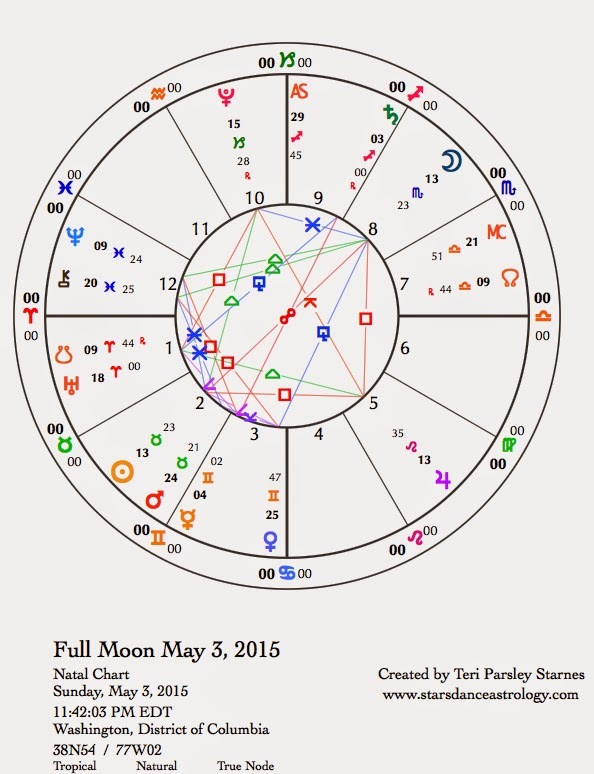 May 3—Full Moon: Illuminating. “Roots down, branches up.” This is the quick version of a Tree of Life grounding. (Grounding, for those new to the concept, is a conscious reconnecting of our bodies with the Earth and with our immediate surroundings. When grounded, we are more aware, awake, and in our bodies.) “Roots down, branches up,” is a good mantra for this Full Moon in Scorpio (Fixed Water). Taurus (Fixed Earth), the Sun’s position and the source of our lunar intentions this month, represents the branches reaching into life. The roots, penetrating deep below in underworld realms, are represented by the Scorpio Moon. The relationship between these two Fixed signs help us anchor Beauty and Strength, Power and Compassion into our lives. “Roots down, branches up” connects the realms of life and death, the wholeness of ourselves—our beauty, strength, power and compassion. Do your grounding under the Full Moon light if you can. Draw renewal from your depths and let your branches spread into the heavens above. In the chart for the Full Moon, the Sun and Moon are both square to Jupiter in Leo (Fixed Fire). There is something very personal about this Jupiter position. Leo longs for personal impact and significance. We can feel small in the face of the vast forces of death and rebirth, but as the guardian of fire, Leo is no lightweight. We tap into desire to merge our essential natures with the Taurus/Scorpio continuum. How do you join this dance, that on one hand is an impersonal exchange between cosmic forces and on the other hand an intimate dance of your soul’s light? The missing sign in this pattern of planets is Aquarius (Fixed Air). Leo needs Aquarian perspective. Insecurities about our impact, hungry egos that constantly ask for affirmation, deadened creative impulses, can be renewed by Aquarian vision and focus on the collective experience. What role does community play in your journey to wholeness? Mercury in Gemini (Mutable Air) opposes Saturn (Mutable Fire) today also. This opposition represents another chance to integrate the intimate world of relationships (Gemini) with the universal world of meaning and truth (Sagittarius). We will try our hardest to express the inexpressible. Although we may not achieve that goal, the trying itself is enough. Recognize this longing in yourself and others. “Roots down, branches up,” what are you noticing about this lunar cycle’s mission to ground our beginnings into sustainable manifestation? The whole of life, the Fixed elements of the zodiac, are conspiring to help us.